Wear- and Heat-resistant Castings for Bell-less Type Blast Furnace | Product Information | KURIMOTO, LTD.
At the top of a bell-less blast furnace, countermeasures have been taken against all sort of wear modes from abrasive wear to heavy impact wear mainly by using high-chromium cast iron materials. 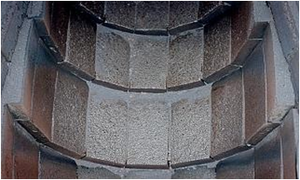 Tungsten composite cast material is used particularly for the rotating chute that is employed in charging raw material into the blast furnace, to drastically extend the life. Suitable high-chromium cast iron material (CIX2T or SHNX) can be selected for the operating conditions of the liner. WC composite cast material (UCX) is used for heavily worn parts to drastically extend service life. 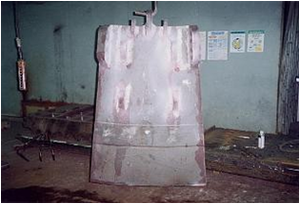 Since protectors are subjected to sudden thermal shocks, they must provide stable creep strength and wear resistance even under high temperatures. 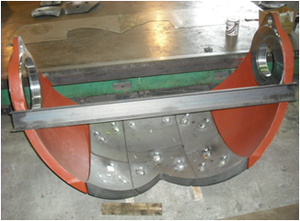 The high-Cr and -Mn based KM Series demonstrate the excellent characteristics of their heat- and wear-resistant wear plates in blast furnaces.